Bob in Colorado has a UHF repeater has been operating on 447.725 MHz here in Monument for a couple of decades now. It started out as a classic “pet repeater” project and has been operating from my basement all this time. Over time it has picked up additional users and has turned into the de facto hangout for our local radio club. The repeater system has gone through a number of revisions over the years, including the RF transmitter and receiver. I wanted to retire the pair of Motorola Mitrek mobile radios I have been using when they started to exhibit a few lose connections. Really though, I thought it was time for some synthesized, modern RF gear in a compact package. I jumped at the chance. Initially, I put it on the air in mixed analog-digital mode with the repeater automatically switching modes to handle either analog FM or C4FM digital. I used the internal controller of the DR-1X which is quite simple and has limited functionality. (The SCOM 7K controller got put on the shelf for a while.) The DR-1X supports using an external controller but implementing the mixed analog-digital mode is…well…challenging. (Various people have figured out ways to do it with modifications to the DR-1X or using additional hardware.) After 10 months of operation, I decided to reinstall the full-featured SCOM 7K controller, enabling quite a few features including a 2m remote base, synthesized speech, automatic scheduling and weather alerts. This does mean giving up the C4FM mode but usage was minimal anyway. The SCOM 7K repeater controller has been in service for decades, handling multiple receivers and transmitters, very configurable with programmable macros. SCOM has long since moved on to a newer, improved model but my 7K just keeps on ticking. The 7K has the voice synthesis and autopatch options installed, so, yes the repeater has an auto-patch (not that anyone cares). A Yaesu FT-7800R is used as a 2m remote base and the duplexer is a classic Decibel Products. Not shown in the photo is a Bearcat WX100 weather receiver that is used to transmit weather information when an alert occurs in our area.  2m transceiver interfaced to the repeater for use as a remote base. details here. Send me an email if you want to know more. workarounds to support this but I’ve decided to just implement analog FM. 1X pin 1 must be connected to ground to enable external control. The DR-1X is programmed from the front panel for FM mode, input/output frequency, power level, etc. grounded Port 1 and left Port 2 open. comes out of the 7K on J2-24. Note that the handy front panel speaker on the DR-1X is disabled when using an external controller. not warranted at full duty cycle. of time (about a minute or so). Communication Specialists TS-32 Tone Encoder was installed inside the SCOM 7K. This was a good opportunity to clean up some of the cabling and physical mounting that had degraded over time. (A kluge here, a kluge there and entropy takes over.) I am happy with the result. The post Rehab for the KØNR Repeater appeared first on The KØNR Radio Site. The most sensitive repeater on Earth? Comments Off on The most sensitive repeater on Earth? It first glance it would seem be the height of hubris to make a claim about “the most sensitive repeater, ever, on Earth” – but the title refers, instead, to a rather technical question: Just how “sensitive” could a narrowband FM receiver that was Earth-bound with “Earth-looking” receivers be? closer to the confluence, where coverage was a bit less of a challenge. This question came up in the mid 1990’s when I was faced with the challenge of providing some radio coverage for the Friendship Cruise, an event in which leisure boat owners would “put on” the water at Green River, Utah and go down, under power, to the confluence of the Green and Colorado rivers in Canyonlands National Park and then power up the Colorado River to the city of Moab, Utah – a total distance of approximately 180 “river” miles (290 km). Unless you have been in this part of the U.S., it is difficult to appreciate how large and remote it is: The area covered is larger than some U.S. states and several European countries, all with a total population of less than, say, 100,000 people. What’s more, even on “flat” ground – if you can find it – cellular telephone coverage is spotty at best and if you are within some of the narrow, deep gorges of the Colorado or Green rivers it is all but hopeless: Even satellite telephones have been proven to be of limited use in some of these areas due to the restricted view of the sky! If there are several hundred people and dozens of boats on this hazardous river course over a period of several days, camping and boating in the wilderness, there is very likely “something” that will happen that will require that help be summoned. Whether this is a mechanical breakdown, running out of gas, or some sort of health emergency the need is the same: Help may be required. To this end there were a number of “rescue boats”: Several patrolling the main group of boaters, one parked at the confluence to make sure that no-one managed take a wrong turn and go down “Cataract Canyon” (read about that set of rapids here – link) and a “sweep” boat at the end that makes sure that no-one is left behind. Since the 1960’s it was amateur radio that had been used as the basis for communications. 1/2 wave) may be seen in the background. Back in the heyday of the Friendship Cruise – in the late 60’s and into the mid-late 70’s – there were hundreds of boats on the river which meant plenty of breakdowns, people running out of gas, problems due to the imbibing of alcohol, and other “mishaps” – and the rescue boats coordinated exclusively via 75 meter HF. To be sure, not all rescue boats were radio-equipped, but enough to “spread the word” if something were to happen. This mode of communications worked well over the 100 mile or so range required since during the daytime, this band offers good, local coverage and the “straight up, straight down” nature (now called “NVIS” – link) of the daylight propagation was good for getting in and out of the narrow (1/4 mile, 400 meter deep) river gorges. 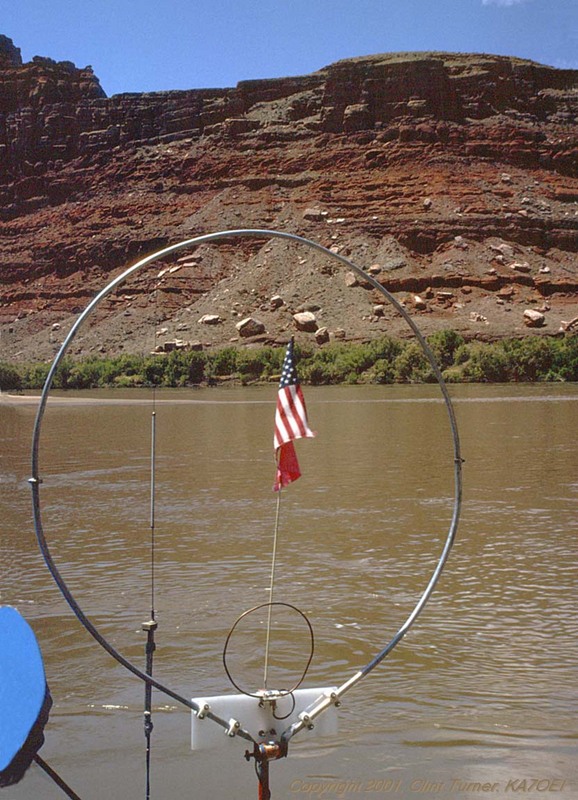 Other frequencies such as those around 10 meters and even VHF had been tried, but they barely got around the next bend in the river – let alone out of the canyon to… where? Flash forward to the mid 1990’s. By this time HF rigs were much smaller than the tube-type rigs that had been used in the 60’s and early 70’s, but it was desired that VHF be used as it was easier to equip boats with that sort of gear – perhaps not all of the rescue boats, but at least some of them on which licensed hams would be carried. Some of them carried VHF rigs and communicated successfully with temporary stations set up in strategic, high locations near-ish the river. The problem was that there was no single location that offered good communications for both rivers over any reasonable distance. By 1997 we decided to try something new. 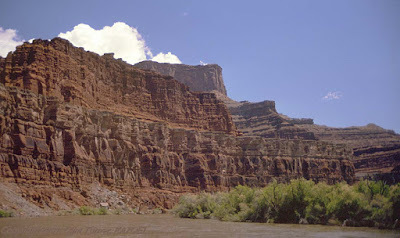 A site on public land had been found that covered much of the course on the Colorado river and due to the “lay of the land” the geography was in favor of being able to get signals in and out of it over most of that portion of the course. At around the same time, almost by accident, it had been discovered that a site called Panorama Point, administered by Canyonlands National Park, offered the possibility of covering at least some of the Green River: In a case of serendipity I had been on a rescue boat the year before and a group of hams camping there just happened to stumble across our limited VHF activity and were kind enough to do occasional propagation checks as I moved along the course on the ‘Green: The results seemed promising. Armed with that information a weekend was carved out for a Jeep trip to inspect Panorama Point and it was visited after a drive on a very rugged, high-clearance four-wheel drive road. After arrival we did some exploring and a site was found for a separate receive station that was distant from the transmitter – and we even talked to another ham on 2-meter simplex in a location farther away than we expected it to cover. Encouraged, we bounced again over the rugged roads and returned to the ranger station and reserved the site. The head ranger for the district had no problem with what we wanted to do – as long as we didn’t deface anything, did not bother any of the wild animals, and “packed out” what we packed in – so a special use permit was issued for the event. Returning home, I knew that I had some work to do! At this point you may be asking yourself, “Self, what in the hell does this have to do with repeaters or sensitivity?” Don’t worry – I’m getting to that! In analyzing the geography and taking advantage of an early topography-based propagation analysis program I determined that while the Panorama Point site had a high vantage point and was probably the very best site that existed to potentially cover the Green River, it likely did not have good radio coverage of the river itself over most of that same area – just the tops of the gorges through which the boats would travel. It would be necessary to radiate as much RF power as practical, blasting the landscape with RF in the hopes that at least some of it would find its way to the river at the bottom via refraction and/or reflection. I would have to do everything that I could to extract the weakest-possible signal from the receive system to grasp the users’ signals that bounced their way out of the very deep river gorges. It had to be portable. This site was at the end of a rugged, high-clearance four-wheel drive road at an elevation of approximately 6200 feet (1890 meters) above sea level with absolutely no amenities. Since everything for the repeater and our very existence had to be crammed into as few vehicles as possible, we need to keep the bulk to a minimum! 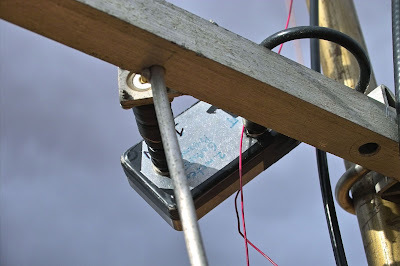 One of the GaAsFET preamplifiers, in place on a Yagi receive antenna. figure in the range 0.8dB or lower. Studying the maps I could see that the transmitter, located at the camp site, would be approximately 0.56 miles (0.9km) away from the receiver. 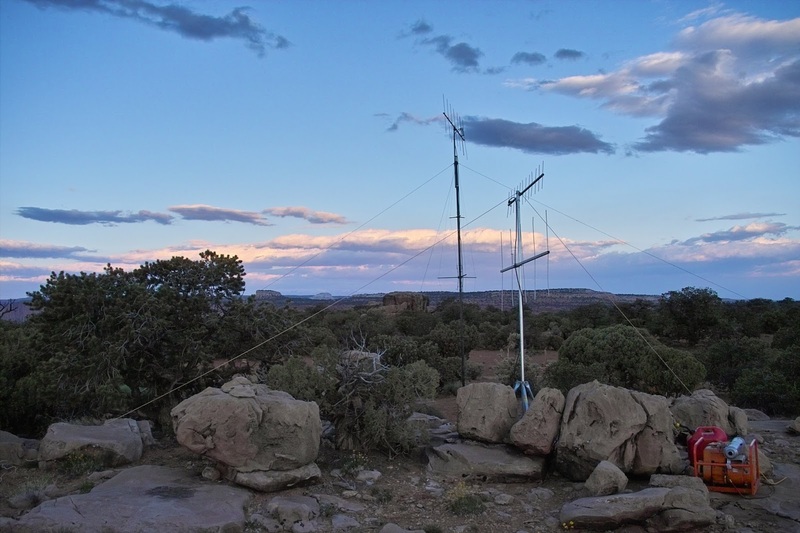 Our receive site had been carefully located to be out of visual line-of-sight of the transmitter, behind a rocky outcropping – but still have a commanding view of the river course to the north. Between this bit of geography and the directionality of the Yagi antennas used for the receiver we calculated that we should have more than sufficient transmitter-receiver isolation to completely avoid “desense” without any need of lossy bandpass cavities in either the receiver or transmitter. That which limits – Thermal noise! I constructed two mast-mounted GaAsFET preamplifiers (18-20 dB gain, somewhere between 0.5 and 0.8 dB noise figure) and a two-receiver voting controller, but I did so planning to “hedge my bets” as much as possible. 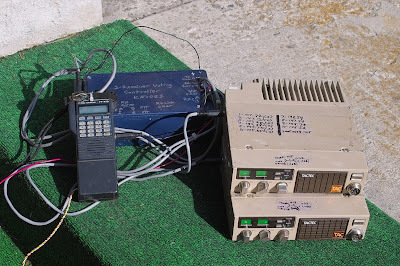 Already having a pair of 5 element Yagis and two identical VHF receivers, the plan was to marry everything together to construct a voting repeater. The link back to the 2 meter transmitter site was via a low-power UHF transmitter (a slightly-modified HT – see Figure 6) and in addition to linking our receive site to our own transmitter, this transmitter’s signal was also received at the “other” site covering the Colorado River, thus tying the two repeaters together. Having constructed these receive systems I decided to check the sensitivity and found that the 12 dB SINAD sensitivity, with the GaAsFET preamplifier inline, was approximately 0.085 microvolts as verified on several different pieces of test equipment! and 30-ish amp-hours of batteries. The environment in which the receive system is used. As it turns out, everything gives off noise – assuming that it is warmer than absolute zero – and the warmer it gets, the more “noise” it puts out. For an example, consider a piece of metal. At room temperature, it does not “glow” visibly, but if you were to heat it, it would begin to glow – very dull red at first, but as it got hotter, it would become closer to being “white hot.” As it cools again, its glow disappears once more to our vision. Just because it may have cooled off to room temperature, don’t think that it isn’t still “glowing” – because it is! As it turns out, any object that is above absolute zero does glow – not only at infrared wavelengths (as you may have seen in footage of police finding criminals in the dark using “heat sensitive” cameras)but also at plain radio wavelengths where it manifests itself as noise. Keeping in mind that all “warm” surfaces “glow” at radio wavelengths, one can complete the analogy by likening a radio signal to a light source on this glowing surface: If the surrounding surface is “glowing” more brightly than the radio signal, that radio signal is simply lost! When numbers are crunched, assuming a 300K (about 80 degrees F, 27C)temperature and a 15 kHz receiver bandwidth, we can calculate that in a 50 ohm system, as is used on a typical receiver, this is equivalent to a noise voltage of approximately 0.056 microvolts when using an isotropic antenna completely immersed in a 300K environment. The above example assumes that we are receiving a signal using an isotropic antenna, surrounded on all sides by matter that is at 300K. While this isn’t exactly the case in a “real world” scenario, it is a reasonable approximation of actual operation of a receive system in which the signals are emanating from the surface of the Earth. The numbers calculated above illustrate that our receive system is, in fact, limited by more than the fact that the signal is just getting weak: The signal is, in fact, being lost in thermal noise being radiated by the earth itself, hence the nature of the title of this article! If you have loss in front of your receive system, this is the equivalent of a noise source. For example, a 3dB loss in front of a theoretically-perfect preamplifier (e.g. 0 dB noise figure, lots and lots of gain) due to coaxial cable, a bandpass cavity, connectors or anything else will still cause the system consisting of that 3dB loss and preamplifier to have a 3dB noise figure: Once you lose signal due to attenuation and it goes into the resulting thermal noise, it is gone forever and no amount of gain or any type of amplification after this loss can or will bring it back! This is exactly why the preamplifier is located at the antenna as depicted in Figure 3: The only losses ahead of the preamp are those of the matching networks of the antenna and preamp and the kludge of connectors required to mate the antenna to it. The losses in the coaxial cable after the preamp and the noise figure of the receiver itself still matter, but are comparatively small contributors to the overall receive system noise figure. How much sensitivity do we really need? On a typical narrowband FM receiver, 12 dB SINAD turns out to correlate approximately with a noise voltage that is 60% of the signal voltage: This ratio can vary depending on receiver design, but not by too much. This means that in a 50 ohm receive system that is terrestrially based(that is, the antenna receives a signal originating from the Earth’s surface) or in a test setup involving dummy loads/attenuators that are at room temperature the maximum sensitivity possible – no matter how good your receive system might be (using a standard 15 kHz FM voice channel)is approximately 0.09 microvolts (more or less) for 12 dB SINAD! With my receivers having a “barefoot” (no preamplifier) sensitivity of 0.15 microvolts for 12 dB SINAD (approximately 5.7 dB Noise Figure based on Figure 5) I calculated that the worst-case sensitivity, taking into account expected cabling and connector losses and assuming a 0.8 dB noise figure for the preamps, that the overall system noise temperature was likely close to 95k, or about 1.23 dB. Clearly this was “quieter” than the 300k noise from the Earth itself! By changing the design of the preamplifiers I could have increased their gain and reduced the system noise figure even more, but doing this might have risked front-end overload of the receivers by also increasing the level of the (strong!) nearby transmit signal, effectively reducing system performance. I now knew that my receiver sensitivity was a reasonable match for the sort of “minimum usable” signals that one might experience in an “Earth-bound” receive system: If I’d made my receive system completely noise-free I would have gained only a dB or so at most since I was already very close to the absolute limit imposed by the noise environment of the Earth – and this did not take into account the antenna system itself. The next obvious step in improving the receive system performance still more was through the use of directional, gain antennas. 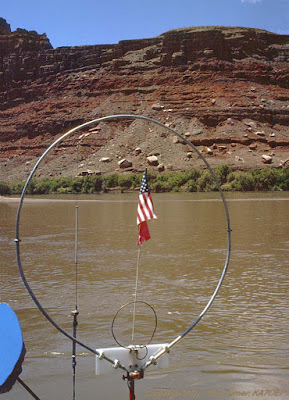 Because the hub of activity on the rivers was toward the north we had the luxury of being able to use such antennas since there was no need for omnidirectional coverage. By limiting the the “field of view” of the receive system with these directional antennas (5 element Yagis) and with the apparent signal gain provided, the absolute signal levels (which included the inevitable thermal noise of the Earth) were increased at the input terminals of the preamp, additionally overcoming deficiencies that might be present in the receive system, not to mention helping reject the strong transmit signal 600 kHz away from the receive signal off the backs and sides of the beam as well as rejecting other signals (from where?) that might encroach from other directions. With this configuration, pretty much all of the signal from the distant transmitter – plus Earth thermal noise – that was being intercepted by the Yagi was being presented to the receiver and there was really nothing more that could be done in practical terms to enhance it further. Even with the preamplifiers and gain antennas, I still wanted to go another step further in improving the apparent sensitivity of the receiver system and this was done by using multiple antennas and receivers in a VOTING arrangement. As the name implies, a voting system compares the signal quality from two receivers simultaneously and selects the best one. Because I was using a pair of identical receivers I had access to the “noise voltage” from the receivers’ squelch circuits and made this available externally to the voting controller: It was a simple matter of comparing the noise voltages of the two receivers to determine which one had the best, “least noisy” signal at any instant and select it. Because each receiver had its own antenna and preamplifier, and since the two antennas were physically separated from each other and pointed in slightly different directions, it was more likely that at least one of these receive/antenna combinations would intercept at least a fragment of the weak, refracted/reflected signal emanating from the distant canyon bottom. The amount of “gain” that this sort of arrangement provides is difficult to quantify as it varies wildly with circumstance, but with these indirect, “bouncy” and multipath-laden signals emanating from the bottoms of distant gorges it is certainly positive! Would a digital modulation scheme have helped? With a number of digital modes available for use on VHF such as “D-Star”, “DMR” and “System Fusion” it would be reasonable to ask if using a digital mode instead of an analog signal would have improved overall system performance. What would work significantly better than FM in terms of weak-signal performance by a significant margin (perhaps 10-fold!) and resistance to multipath distortion is good, old-fashioned SSB owing to its narrower bandwidth and more efficient means of conveying voice on the carrier. In theory it should be possible to construct an “SSB Repeater” compatible with the modern, all-mode and readily-available transceivers, but since this would add apparent complexity on the part of each user, this was not seriously considered! If you remember further that with a “typical” repeater consisting of a single antenna and duplexer that it not uncommon to experience a bit of “desense” where some of the energy of the transmitter causes a decrease in sensitivity of the receiver, the situation gets even worse! 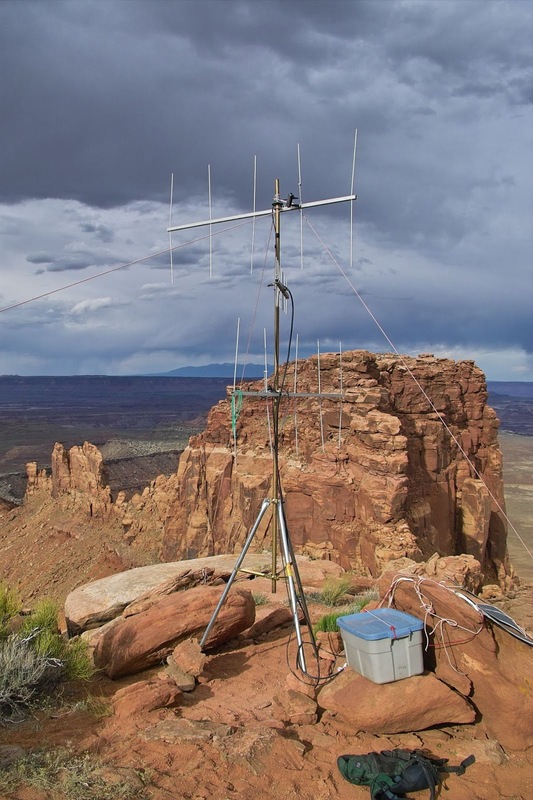 Consider that both the receiver and transmitter systems for this portable repeater system used Yagi antennas that offered approximately 10dBi gain on both receive and transmit. When one takes into account the difficult nature of running full duplex on a Yagi with the possibility many “nonlinear” junctions causing a minute amount of energy to be produced and cause some desense – plus the fact that this had to be a “portable” repeater – one can chose to see why we chose to avoid the bulk, expense, loss, and awkwardness of any cavities at all and used a repeater with a geographically separated transmitter and receiver. All of this leads to an interesting question: Would an “ordinary” repeater, with its typical single transmit/receive antenna multiplexed with cavities and commensurate losses, plopped down at this location have provided useful coverage in this particular instance? Based on the observed signal levels: No, I don’t think so! This repeater system was used, with minor modifications, from 1997 through 2011, the most recent Friendship Cruise, and the software for the homebrew, PIC-based voting controller was modified to include charge control of the solar panels, implement power-saving features for the receivers and to report some telemetry with the IDs. On the transmitter side a 300 watt amplifier was typically used with a 5 element Yagi to blast well over 2kW EiRP of RF in the direction of the boats – all without “desensing” the repeater’s receivers in the slightest even though the receive site was generally within the pattern of the transmit antenna! UHF link – everything was legal! It is fair to say that the repeater worked phenomenally well! In the few days that it was online for the event each year that it was used it was not uncommon for someone to stumble upon it while scanning, sometimes from a very long distance, well outside the intended coverage area. Even though it was intended to cover mainly the Green River’s course it turned out that there were very few places on either the Green or Colorado Rivers that the repeater did not cover – or at least a “hot spot” could not be found. Because we were “stuck” out in the middle of nowhere at this site, many hours drive from “civilization” for 4-5 days, we had plenty of time to observe how the repeater system worked. As you can imagine, in the first couple of years that the voting system was used its behavior was carefully observed to see if it was really helping dig out signals and at times, the local speakers on the two receivers comprising the voting system were turned up while a distant station was transmitting. It was often the case that one could hear the transmitting station fade out of one receiver – but not the other – as the signal bounced its way out of the deep river gorges and off the rocky rims above, this on two antennas that were about a wavelength apart and pointed in slightly different directions, proving the worth of the voting receivers while offering an eerie “stereo” type effect. Not surprisingly, standing at the receive site and switching to the repeater’s “reverse” (the input frequency) in such situations while listening on a handie-talkie using a large whip typically yielded either a barely detectable signal or nothing at all while the repeater happily relayed signals that were often full quieting! One of the interesting aspects of this system was the difference in the “sound” of weak FM signals on this system. On a typical FM repeater system a weak signal develops “popcorn” noise as the signal gets weak – a rather strong, staccato series of random noise pulses that appear on the audio as signals get weak. While these receivers exhibited this same behavior when connected directly to an antenna, when configured as they were with this system using the GaAsFET, mast-mounted preamplifiers and “Earth noise” dominating this noise “popcorn” was almost entirely absent with weak signal seeming to disappear into a sea of steady, even “hiss” instead, not too unlike what one hears on VHF/UHF SSB signals. In the case of Earth-to-Space communications, great care is taken in the design of the antenna system to prevent it from “seeing” the “Earth noise” as much as possible. If this is done it is possible to construct a receive system that will hear spacebourne signals that are much weaker than those that could possibly be detected from Earth-based sources. In fact, with such systems it is not uncommon to be able to see a significant increase in “no signal” readings when the antennas are lowered to zero elevation and pick up “Earth noise” as compared to when they are pointed into space – unless they are pointed at the (noisy!) sun – but that’s another topic altogether! Another interesting phenomenon – not too unusual with voting receivers – can occur when two stations are “doubling” (e.g. transmitting at the same time) but just happen to be located such that each one is only getting into only one of the receive system’s antennas. Although it occurred only rarely, it was very odd to hear two completely different voices, both “full quieting” and with no obvious heterodyne, the syllables of speech being randomly interspersed as the voter switched between the two stations! Being able to communicate for the public good for the safety and well-being of all of those involved. To give those involved practical, real-world experience in operating out in the field under “less than ideal” conditions where there is absolutely no backup via the commercial or public infrastructure. To try out new ideas and techniques to make communication work in a very challenging geography! Now, isn’t that what amateur radio is all about?